Strawberry Theatre Workshop (aka Strawshop) is an award-winning Seattle theatre company founded in 2003 by Greg Carter, associated with a movement to improve wages for professional theatre artists. Strawshop performed seven plays at the Richard Hugo House from 2004–2006, before moving to the Lee Center for the Arts and eventually to the Erickson Theatre Off Broadway on Capitol Hill–where we performed five summer seasons from 2008-12. In January 2015, Strawshop began performing in a new arts space developed by Capitol Hill Housing called 12th Avenue Arts. Strawshop designed and is managing the new venue in a partnership with New Century Theatre Company and Washington Ensemble Theatre. In its genre-breaking history, Strawshop has produced two narrative theatre adaptations, three plays for puppets, four musicals, three original works, ten West Coast premieres, as well as material from the canon of Ibsen, Miller, Fo, Brecht, Wilder, and Mamet. Between 2008-2010, the company featured a series of plays called Biograph that included stories of real people, such as Life of Galileo, The Elephant Man, and Lady Day at Emerson’s Bar & Grill. The series concluded in 2010 with productions of The Laramie Project and Breaking the Code. In response to the 2017 National Women's March, Strawshop announced a season of work focussed on women, including two plays with all-female casts, and a third written by Pulitzer Prize winning playwright Paula Vogel. In 2007, Strawshop received The Stranger newspaper’s Genius Award for an Organization—a prize awarded in other years to On the Boards, Pacific Northwest Ballet, and the Frye Art Museum. Actors associated with Strawshop have won Genius Awards as Individual Artists in Theatre including Gabriel Baron (2005), and Amy Thone (2007). Composer/designer John Osebold—who designed The Laramie Project at Strawshop—was the Stranger Theatre Genius in 2012. The company was nominated in five of six categories in the inaugural Gregory Awards hosted by Theatre Puget Sound in 2009. Don Darryl Rivera was the winner as Person to Watch, having created music for Strawshop’s The Elephant Man and Gutenberg! The Musical! In 2012, Strawshop became the only theatre in Seattle nominated for a Gregory Award for Outstanding Production four years in a row: The Elephant Man (2009), The Laramie Project (2010), Breaking the Code (2011), and Accidental Death of an Anarchist (2012). This recognition was made more remarkable by the fact that Strawshop only produced nine plays during the four years considered. Strawshop artists Robertson Witmer (sound), Andrew Smith (lighting), Brendan Patrick Hogan (sound), and Sheila Daniels (directing) are individual Gregory Award winners. Amy Thone won the Gregory for acting in a Supporting Role for The Normal Heart in 2014. Strawshop received additional nominations for Outstanding Production in 2015 (Our Town), 2017 (Lydia), and 2018 (Frost/Nixon). 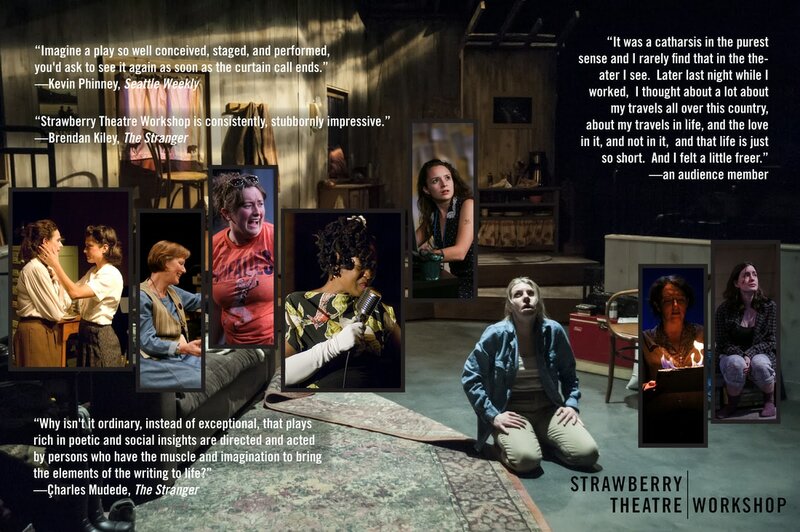 The Seattle Times critic Misha Berson has named Strawshop winners of several annual Footlight Awards, including best performance by Amy Thone (2008), Felicia Loud (2009), Bradford Farwell (2010), Reginald Andre Jackson (2011), and Peter Crook (2012), as well as best scenic design by Montana Tippett (2012). Footlights for best play were given for Accidental Death of an Anarchist (2005), Leni (2008), The Elephant Man (2009), Breaking the Code (2010), The Bells (2012), The Normal Heart (2014), and Our Town (2015). The Times retired the awards after 2015. Since 2013, Seattle Theatre Writers have nominated Strawshop productions and artists in multiple categories for the Gypsy Rose Lee Awards. In 2014, actor Greg Lyle-Newton won the award for Excellence in Performance for The Normal Heart. In 2017, Lydia won Gypsies for director Sheila Daniels, designer Reed Nakayama, and performers Sofiá Raquel Sánchez and Andrew Pryor-Ramírez.